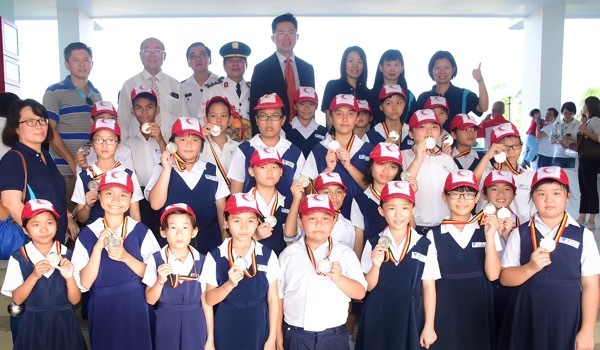 Deputy Chairman of SRDC, Robert Lau (fourth right, last row) with Penghulu Chua (fourth left) and other MRC members posing with one of the winning schools. SIBU: The Sibu community here always has a wrong impression that the Malaysian Red Crescent (MRC) society is a government agency because of its ‘Red Crescent’ emblem. The Chairman of MRC Sibu District, Penghulu Chua Hiong Kee clarified that the Malaysian Red Crescent is actually part of the world’s largest voluntary humanitarian service organsiation. “The Malaysian Red Crescent is an NGO – Non-Governmental Organisation. “We don’t receive grants from the government. That is why we need fund to run our activities throughout the year, such as for the purpose of training humanitarian services and management expenses,” he pointed out. In relation to that, Chua said the people of Sibu have always being very kind and generous towards charity, including contributing towards the MRC Sibu District fund. “On behalf of MRC Sibu District, I wish to appeal to all our kind and generous well-wishers for their fullest support towards our annual ‘Run For Health’ fund raising project, to be held on Sept 2 this year,” he added. He was speaking at the MRC Sibu District Annual Inspection Parade 2018 held at Stadium Tun Zaidi here yesterday. The Guest of Honour was Robert Lau, the Deputy Chairman of Sibu Rural District Council (SRDC). Chua also called on everyone to make a concerted effort towards the ‘Tree Panting Campaign’ proposed by the MRC Sarawak Branch Chairman, Datuk Patinggi Tan Sri Dr George Chan. “It has become one of the core activities for MRC here. The effort starting from our family, schools, the community and the private sector, with the objective of wrapping up Sibu into a canopy of greenery and beautiful environment to live in. “Trees are not only beautiful, it is also very important for the health of our ‘earth,” he stressed. Chua called on everyone to make the event a joint project with other NGOs and also the local council in making it a memorable and meaningful event that will have lasting benefits for the Sibu community and MRC. “It has been said a good leader inspires others with confidence while a great leader inspires others to be filled with confidence. “Today, I urge my committee members and all the Youth and Link Officers to step forward and inspire to motivate our members to believe in themselves, in the power of courage, commitment and action. “This is vital because we need to develop the type of quality and visionary leadership that our MRC Sibu District needs to put our vision into concrete action. “This will not be an easy task because it needs commitment, enthusiasm, sacrifice and dedication. “But leadership is crucial if we are going to meet with optimum success in making our service a greater vehicle for humanitarian involvement,” he said. MRC Sibu District to hold fundraising run on Sept 2 0 out of 5 based on 0 ratings. 0 user reviews.